Love Happened with a simple sketch of a chair over cocktails in a New York City lounge. As the grace of the pen took to the paper my desire to possess this chair and create more pieces with the same empowerment began my journey. The KOKET brand is truly a personal reflection of who I am. It offers a glimpse into my world and everything that moves me. It is all about what I believe in, where I have been, and where I take the brand is closely tied to my personal growth. I am comfortable taking risks and often turning heads and commanding attention. KOKET is not about design trends or fulfilling design voids. It is a highly edited curation of décor and content filled with the experiences, simple pleasures, passions and life events that have shaped me. KOKET’S SAVOIR FAIRE IS INTOXICATING! The line is manufactured by master artisans and jewelers who leave no detail or element forgotten. 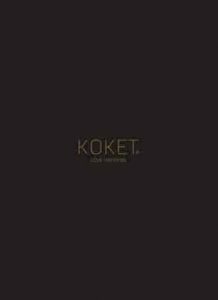 KOKET’s principal designers are a group of exceptionally artistic and well-rounded product designers who are led by Janet’s creative eye and almost fanatic strive for perfection. NEED MORE KOKET INFORMATION ?